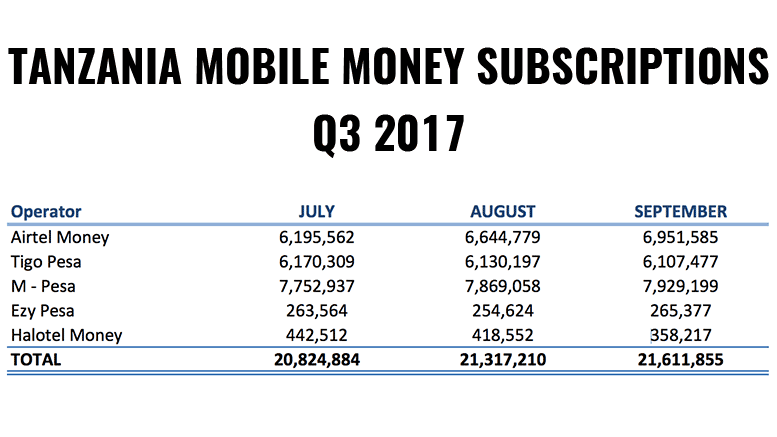 The recently published Quarterly Statistics Report of Q3 2017 by the Tanzania Communications Regulatory Authority (TCRA) indicates that Mobile Money Subscriptions (Mobile Money Accounts) reached 21,611,855 in September 2017. This represents an increase of 1.3 million accounts or +%6.5 compared to 20,285,810 at the end of Q2 2017 and an increase of 4.2 million accounts or +24.1% compared to 17,406,033 registered in September 2016. The mobile money market continues to be dominated by M-Pesa of Vodacom with 37% market share, closely followed by Airtel Money with 32%, Tigo Pesa with 28%, Halotel Money with 2% and Ezy Pesa of Zantel with 1%. However, M-Pesa and Tigo Pesa have lost ground in the last year, from a 41% and 36% market share respectively at the end of Q3 2016, while Airtel Money has increased its market share from 22%. Ezy Pesa market share has remained unchanged while Halotel Money only launched in April 2017, gaining since 358,217 users. Mobile money was first introduced in Tanzania in 2008. Total value transactions reached TZS 50 Trillion in 2016-17.